Cavigal Nice 06's first season in the Ligue Féminine de basketball ended with relegation despite the team playing some excellent basketball. Unfortunately for former coach Olga Tarasenko her team lost too many close games. Veuillez trouver des informations en français sur l'effectif de CVNB06 pour la saison 2012-13. Tarasenko's long history as the coach of the club came to an abrupt end this summer (2012) with no formal announcement. Her replacement is the former assistant coach from Challes-les-Eaux Rachid Meziane. Meziane's last act with Challes-les-Eaux was to win the U20 National Championship (Espoir). The following Nice players from last season have also gone: Merike Anderson, Małgorzata Babicka, Kelsey Bolte, Barbara Cousin, Krysten Boogaard, Stéphanie Dubois, Majda Ghariani and Aminata Konate. Under the rules of the Ligue Féminine, clubs can only play five new players (players transferred to the club) in a match. As a result most clubs at this level do not recruit more than five players. In addition clubs must have four players under the age of 23 in each game. The five new players for the Niss'Angels are: qualified school teacher Anaïs Déas, Margaux Galliou-Loko, Marie-Eve Paget (Challes-les-Eaux Espoir), Alexandra Tchangoue (Arras) and Margaux Okou Zouzou. Technically Okou Zouzou does not count as a transfer because she did not play last season although she finished the season training with Perpignan. Tchangoue informed wbbif at the Open LFB 2012 that she could not wait for the new season to get started. 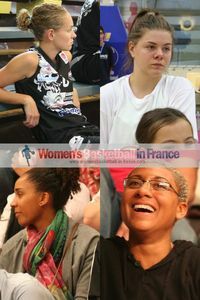 The players coming back are: Elodie Decker, Fabienne Constant, Guiday Mendy, and Jeanne Senghor-Sy. They are joined by Léa Moschetti and Assitan Diarra from the club's academy. Cavigal Nice have a good mix of youth and experience. All the new players coming in have experience of playing in the LFB. So the team should start the season as one of the favourites to host the Final Four in May. Avec un nouveau coach et cinq nouvelles joueuses dont toutes avec de l'expérience en LFB la formation niçoise devrait se montrer à la hauteur pour relever le défi de monter à nouveau en ligue féminine de basket.